Shaving every morning before going to work was such a hassle for me since I have thick beard and my work starts early. I never quite felt clean after shaving because no matter how much I shaved, there was always some hair left or it would look like I have 5 o'clock shadow, and in the worst cases, it would even grow back by afternoon. However, after receiving facial hair removal treatment, I never had to go through such a hassle again, and my colleagues told me "you look so much younger." Because I only wanted to remove the hair remaining below my jaw line, I was refused by laser hair removal services. 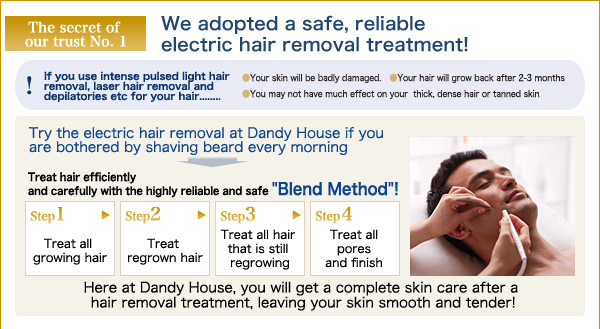 Dandy House's hair removal can remove the hairs one-by-one, they could accommodate my request and I chose them. Before getting hair removal, I did not like to look at myself in the mirror because my beard was too thick. Since I started going to Dandy House, I could see my beard getting thinner gradually , which was really exciting. Shaving in the morning also became much easier; I'm really grateful. The hair removal technology is great! I can see the result each time I visit Dandy House, and because they offer great after-care service as well I strongly recommend Dandy House. Thumbs up to Dandy House's men's hair removal! Having a thick beard that regrows soon (a 5 o'clock shadow) was really stressful. Even after I decided to get hair removal, I was half in doubt. However, now it's all very smooth and soft around my mouth and I'm not seeing any hair regrowth. Because I'm no longer stressed about my beard, I see myself changing. Although saying that hair removal can change lives may sound like a bit of an exaggeration, I have witnessed myself change a great deal. I was troubled because of thick facial and back hair, and was debating whether or not to go to a men's hair removal salon. Although I was thrilled when I found out that Dandy House offered men's hair removal service, I was half in doubt thinking 'hair removal at men's beauty salon?' However, I'm so glad that I did it. I would have done it sooner if I had known how great and clean it made me feel. Because of my thick beard, I was often told that by evening, I look as if I'd turned into a thief in Japanese comedy. I was really stressed out about my thick beard. However, my life has changed drastically thanks to Dandy House's hair removal. I don't see any hair growing back now. With my new clean look, I look more intelligent and I'm doing so much better at work and private life. We speedily remove each hair one-by-one either on the entire body or part of the body such as facial hair, beard, hair on the chest, legs, or back. 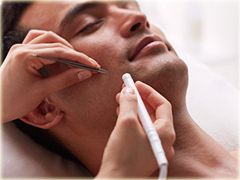 The individual hairs are carefully removed one by one, making this hair removal treatment more accurate than others. Hairs to be removed or kept can be specified precisely by the client, making this treatment especially appropriate for facial hair removal. Leave post-hair removal skin care to us. Both domestic and international hair removal specialists who are qualified in hair shaping and trimming aim to give you clean skin. By waxing, we aim for smooth bare skin.